Nothing askew about this, it’s just their family name. This is the second album so far by Askew sisters Hazel (vocals and melodeon) and Emily (violin and backing vocals) and it’s just lovely, a real delight, superbly recorded and produced for Wild Goose by Andy Bell. Three of the eleven tracks are dance tune sets, beautifully played, the others are traditional songs from the British Isles (mostly English). Hazel and Emily’s approach reveals a deep connection, understanding, knowledge, and love of traditional dance music and song, and at the same time their classical training is apparent in the deliberation and control of the playing and singing. This is skilful, thoughtful, careful, measured music making. I never cease to be amazed at the richness of our native musical heritage in Britain, at the subtle beauty of so many of the dance and song tunes, these treasures saved for posterity (us and our descendants) by the collectors. In many cases there are songs recorded in several, or sometimes many, versions or variants – of words, of melody, of rhythm, of pace. The skilful lover of this material can find a lifetime’s supply of gems to cut, to polish, to set afresh, to re-arrange and re-present. The Askews are certainly in that category, and here offer brand-new presentations of Child ballads Henry Martin, Lord Bateman, and The Two Sisters (here called The Bonny Bows of London Town); of the song about the sailor pulling on a string, of the one where she wishes she was a blackbird, and the one about the turtle dove and going ten thousand miles. And the beautiful Sweet Lemaney. It’s not only great arrangements of great material though. It’s worth saying that Hazel can really play the melodeon and bring to it her own expressiveness and character, Emily can really play the violin and bring to it her own expressiveness and character, and Hazel can really sing. This woman can really sing, and that’s always something special, because there’s not enough of it about. I bet I’m not the only reviewer who loves this album. Bloody gorgeous. An excellent second album from Emily and Hazel Askew, young musicians with talents to match or exceed some more heavily-promoted names. Melodeon, violin and vocals, unaided by guest musicians, create rich textures for an uncompromisingly traditional set of songs – including several major ballads – and instrumentals. Their arrangements are constantly inventive, from the minimal twin-fiddle pizzicato on Sweet Lemaney, to unaccompanied two-part harmony on Jack the Jolly Tar, and an all-stops-out attack on Henry Martin. Hazel’s singing has mellowed a little since their first outing, while Emily’s ever-changing solo fiddle part on a cleverly-assembled version of the Two Sisters ballad is reminiscent of Dave Swarbrick’s classic accompaniments to A. L. Lloyd’s singing. The instrumentals are crisply played with imaginative variations, and the whole is as strong an affirmation of traditional English folk as you’ll hear from the younger generation. The Askew Sisters deserve to go far. This second album from winning sibling act Hazel and Emily Askew, although again firmly traditionally-based, makes a virtue out of fresh and imaginative reinterpretation of its source material, in which respect it eclipses its predecessor. The opening track, which leads a spooky morris tune hesitantly by the hand into the lonesome woods of the title, is attention-grabbing for all the right reasons: an expert control of pacing and dynamics, glorious tone from both melodeon and fiddle, the instrumentation creatively and tellingly cascading back and forth beneath a captivating vocal rendition (by Hazel) of the beautifully dark imagery of the song text, and even some eerie vocal harmonies creeping in towards the close... magic. The sisters then bring us back to earth with a vibrant set combining morris and country dance tunes, taken at a not-quite-dancer-friendly lick! This sets a kind of pattern that judiciously intersperses vocal and instrumental items through the disc, though with a balance weighted in favour of song. Aside from one sisterly a cappella item (the saucy Jack The Jolly Tar), all the songs make excellent use of the varying textures that can be achieved from combining sweeping reed and bow strokes in an impressive and intelligent versatility of switching of parts, combining and alternating melody and harmony lines for continued musical interest without distracting from the storytelling. The playing of both sisters uncannily shares the vital characteristics of being at the same time strikingly lyrical and full of atmospheric feeling, also packing an infectious rhythmic punch where desired which on Paddy Carey's Jig even includes the adoption of what Hazel self-deprecatingly terms "a cheesy bassline"! With Hazel's confident and mature singing, the responsiveness to the text works both ways and the inherent drama is invariably enhanced. A good example of this comes with The Bonny Bows Of London Town, a collation of various versions of the Two Sisters ballad, which draws much of its impact from ingenious use of instrumental effects and textures that avoids any sense of artificial contrivance. The sisters' fine version of the enigmatic Sweet Lemaney is a further illustration of their creative approach (and uniquely features duetting pizzicato fiddles), while their take on Lord Bateman is hardly less compelling. Hazel and Emily have clearly thought hard about how best to bring these songs alive, and their liner notes are just detailed enough to indicate they've done their research but without boring us with showy scholarship. Even on the more well-known song choices the sisters have something of their own to contribute to the folk process, and the disc is a triumph. 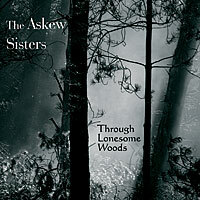 "Three years after their critically acclaimed début, 'Through Lonesome Woods' cements The Askew Sisters' reputation as shining stars on the British folk scene. The title track is partnered with the traditional Morris tune ‘Saturday Night’ for the album’s highly evocative opening track. Making the most of the melodeon’s long sustained notes the pair set a mournful tone, which captures the essence of both the story ‘Through Lonesome Woods’ and of the bleak forest, which adorns the album cover. The pace changes instantly however, as the pair launch themselves into a set of tunes. A pair of Morris tunes separated by a country-dance, you’d have a tough time dancing to 'The Blue Eyed Stranger/Goddesses/Mrs Carey' at this speed! Known for their energy, the various tunes demonstrate their respective instrumental talents and impressive musicianship. With 'The Bonny Bows of London Town', the pair delves into the dark underside of the capital, albeit not as gruesome as some versions would have it! Nonetheless, the result is one of the stand-out tracks from the album. The haunting tone is set from the very beginning, with Hazel's crystal clear vocals telling of a sister’s plot to do away with her fairer sibling, while underneath Emily captures the tense atmosphere, making the most of the lower register of the violin. Simply breathtaking. In their cover notes The Askew Sisters describe the story of 'Lord Bateman' as a "bit of a gap year", and their version of the Child Ballad reflects the adventurous nature of the ill-fated Lord's travels. As well as being beautifully crisp and clear, Hazel's vocals are also highly sympathetic to the emotions at play throughout the story and so you can hear the playful determination in her voice. Truly uplifting, this is a beautiful version of a well known story. An entirely traditional collection, the album is a beautifully balanced mix of the mournful and the upbeat and with extensive cover notes, the Askew Sisters demonstrate their grounding in the traditional tunes they have chosen to appear on this, their second album. I remember the first CD the Askew sisters made while they were still at school. It had about 6 tracks – it was a present from their father, Bob Askew. I thought that they were pretty good then, showing considerable inventiveness and artistry. Not surprisingly they have gone on to develop phenomenal skills on their respective instruments (melodeon and fiddle) and Hazel’s voice has acquired both flexibility and maturity. They both are highly trained and accomplished musicians in the classical genre, yet they are firmly grounded in folk traditions both through their own involvement in Morris, sessions and festival-going and also through their father’s involvement in song research. This shows through in everything that they do. This CD has a rich mixture of Morris, English Country Dance Music and Playford tunes along with Child Ballads and other songs collected from singers long ago by George Gardiner, Cecil sharp et al. The manuscript sources of the songs and tunes are rigorously detailed in the sleeve notes – something which is very rare these days when so many performers repeat songs they heard from other recordings without bothering to go back to the original sources. The CD starts with a very atmospheric version of Saturday Night, a morris tune from the Longborough tradition which you would find it impossible to dance to, but never mind that – it soon becomes a hauntingly beautiful and rare song – Through Lonesome Woods. The rhythmic accompaniment of the melodeon is amazing – it sounds as though there is a drum beating. I would love to know how Andy Bell, who did the recording, managed to get this effect. Their Playford tunes are glorious. The tune arrangements are complex, yet never hide the essential melody line. There are times when it is hard to believe that there are only two instruments playing. I am pretty sure that Vaughan Williams would have approved of their treatment of the traditional tunes. The transitions between the tunes in the medleys is nothing short of brilliant. I loved their 3/2 set, Walsh’s The Presbyterian being a tricky old thing to play. No problem for these two! The sisters allow the melody line to shine through in every track, the voice never once being subservient to the accompaniment. I particularly liked The Bonny Bows of London Town - a version of The Two Sisters. The fiddle accompaniment is unsurpassed in any other recording I have heard, and the fact that the song is sung by two sisters adds a frisson of reality to the performance, particularly when they duet as the song progresses. This album deserves to be a sell-out. It is definitely the best I have heard from the "new wave" of folk artists. If you get the chance to see the sisters locally – please go. I know that they are at the Milkmaid in Bury St. Edmunds on October 1st. Book your ticket now! "This record shows that the development of the Askew Sisters, in both technique and artistry, continues apace. In it, there is a wide variety of material with complex arrangements, and familiar material is given a distinctive attention to detail and put together with well-chosen variants. There are three ballads which deserve highlighting: Henry Martin, The Bonny Bows of London Town and Lord Bateman. If singers add accompaniments to well-known ballads then they need to ensure that they do it for a reason. The Askews' accompaniments emphasise without intrusion, and yet they still manage to draw out underlying meaning and point the attention of the casual listener to that which might just be missed. They deserve very close listening. As well as these three classic ballads, there are four instrumental tracks taken from sources such as Playford and Offord, and some morris tunes, not always played at dancing speed, but played for sheer enjoyment; the slow morris tune from the Longborough tradition which leads into, and sets the scene for, the title track is a perfect choice. The rhythmical playing, especially of the hornpipes, will set feet banging and the jig Paddy Carey's does indeed have a cheesy base line, as the liner notes suggest! Sometimes the rhythm which accompanies the songs is simply steady rather than pushing the tune along, allowing the material to shine through even more clearly. Other songs include Sweet Lemany, Jack the Jolly Tar (a lovely a capella track with clever harmonies), and If I was a Blackbird, all taken from a variety of sources and all put together with studios clarity. The Askew Sisters have created an outstanding album, and they will again be gracing the folk club and festival stages this summer. You are urged to go, see and listen." "This is the third CD from this young London based duo and they are still getting better. This CD consists of eleven tracks, both songs and instrumentals. Don't be misled by that low number, seven are over five minutes long and, curiously, Lord Bateman isn't the longest. The title track is a beautiful song, known only from one source in Hampshire. That is followed by a classic Askew tune set starting with Blue Eyed Stranger, switching to the lovely 17th century dance tune Goddesses then back to the Cotswolds for Mrs Casey. The sisters are both highly skilled musicians with Hazel on melodeon and Emily on violin giving sensitive but powerful accompaniments that drive the songs along. There is only one song unaccompanied, which is Jack the Jolly Tar which is a little more polite than most versions, as it doesn't end with 'fifteen sailors pulling on the string'. Throughout the CD Hazel's voice is a joy to listen to. My favourites have to be the lilting If I Were a Blackbird, the swashbuckling Lord Bateman, and The Bonny Bows of London Town which is an amalgamation of several versions of The Two Sisters and includes the obligatory fiddle built from body parts."